Kaitlyn Ashmore joined the Ballarat Rebels youth girls state academy on Monday night. 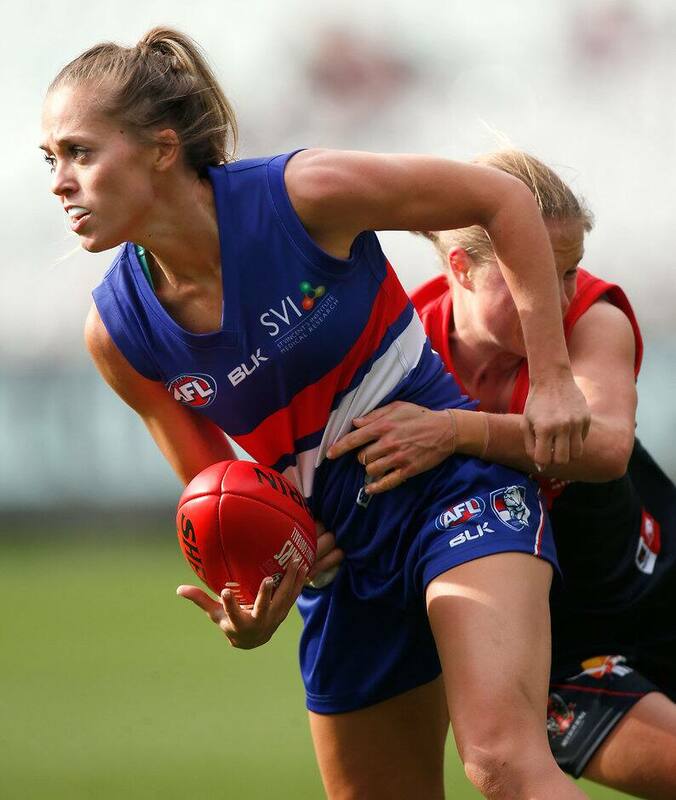 Western Bulldogs women’s player Kaitlyn Ashmore says the future of the women’s game is bright, following the development of youth girls academies across the state. Ashmore visited the North Ballarat Rebels youth girls state academy on Monday, which comprises players from Casterton, Hamilton, Warrnambool, Ararat and Horsham. With plans for a national women’s competition well underway, Ashmore said the development of the state competitions was also a positive for the game. “It’s just great,” Ashmore told the Ballarat Courier following the session. “If there was youth girls when I started playing, I would have done it. “The future is really good – when I played at school, we couldn’t even fill a team some weeks. Ashmore was a member of the history-making women’s exhibition matches this season, with the Bulldogs and Melbourne taking part in the first ever live broadcast of an AFL women’s game. After training with the academy, Ashmore provided some words of wisdom from her experiences this season. “I can’t even describe how it felt… It’s the best feeling ever. The Rebels academy includes 44 players – selected from trials and Youth Girls shield games in September. Academy coach, and Bulldogs women’s assistant coach, Jeff Whittaker said he was delighted with the progress. “For some of these girls, to come three hours to training, is just amazing. “I suppose the girls now realise that there is a pathway.